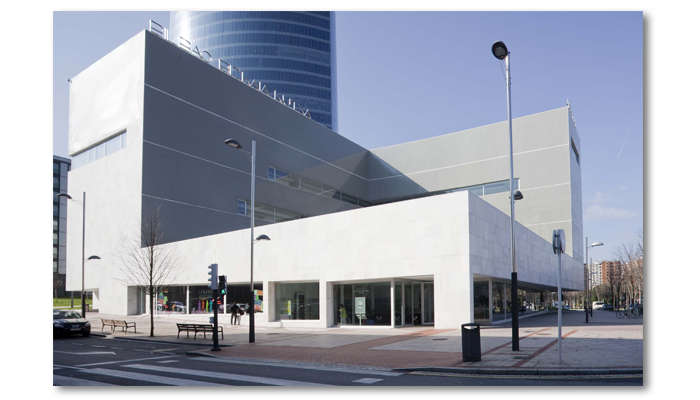 The conference will take place at the Arriaga auditorium located in the Bizkaia Aretoa building. Bilbao Airport is directly connected to some main European cities, such as Barcelona, Madrid, Amsterdam, Brussels, Frankfurt, Istanbul, Munich, Lisbon, London, Paris, Rome, or Zurich. Check either the official web page of Bilbao Airport or its wikipedia webpage for details about flights, airlines and services. Bilbao Airport is about 12 Km from Bilbao, and it is very well connected to Bilbao by bus. The bus line 3247 (operated by BizkaiBus) connects Bilbao centre —Moyúa square, with Metro station— and the city bus station —Termibus— with the airport. It runs every 30 minutes, from 5:25 am to 21:55 from Bilbao to the airport, and from 6:15 am to 24:00 from the airport to Bilbao. The journey takes 15 minutes to Moyúa and 20 minutes to Termibus. A single ticket costs around 2.00€. Both at Moyúa and Termibus one can transfer to the Bilbao Metro and from there to almost every part of the city. The taxi journey to Bilbao takes around 15 minutes and costs about 30€. It is also possible to rent a car at the airport. The central train station Abando is well located at the centre of the city, and conveniently linked to all the public transport options operating within Bilbao (see below). Long distance lines arrive to Bilbao from Barcelona and Madrid and other main cities. Check the Abando and RENFE web pages for information about lines and schedules. There is another train company, FEVE (official webpage in Spanish here), which links Bilbao to all the Cantabric coast line to the west, to Asturias. The FEVE station is, in fact, next to the Abando station. Several long distance (as well as local) lines arrive to Bilbao at the main bus station Termibus. See its wikipedia page here for further information. Termibus is perfectly connected to the Bilbao public transport net since it has a metro station right on the terminal. •BilboBus city buses net, which covers all the Bilbao area and most of its surroundings. •BizkaiBus, serving the whole of Bizkai. •Metro, the fastest way of traveling to most places in Bilbao and the surroundings. •Euskotran, the tram, which links the area around Termibus with most of the amenities in Bilbao up to the old town. Note that buses and metro hardly run during the night. Both the central train station Abando and the main bus station Termibus are connected to the three means of transport: underground, tram and bus.